Posted by alwaysjan in Pets. My dogs keep me sane. Just when I’m taking myself or the world way too seriously, our two mutts Petey and Reese engage in their nightly wrestling match that is every bit as entertaining as Lucha Libre. Same thing every night, and every night I laugh hysterically. Every morning Reese sits just inside the dog door so our pig Maisie can’t come in the house. Then later in the day, Maisie lounges in front of the dog door so the dogs can’t go out. It’s like having toddlers again. The pig thinks she is a dog and lines up with them for a treat. We refer to them as The Three Amigos. Petey, who we believe is half coyote, is the hunter. His prize catch is a sock, which he carries proudly around the house. Thank god dogs threw their lot in with humans, or Petey would have starved to death in the wild. I recently read two interesting articles on dogs. MSNBC featured an article Dogs are Smarter Than Toddlers. Neither of my dogs would qualify for Mensa as they’re blissfully happy to be canine underachievers. Pet Dogs Rival Humans for Emotional Satisfaction in New Scientist is also a good read. Researchers found that after playing with their dogs, people showed an increase in oxytocin, known as the “cuddle chemical.” I could have saved those researchers a big wad of cash and told them that up front. Nothing helps put the problems of the world in perspective like a good game of fetch. My father-in-law’s dog, Penny, recently died after a long happy dog life. He so misses her company that he’s taken to walking his neighbor’s dog every night. Our friend Mario, who’s an opera singer, took the picture of his dog Spaghetti who loved to sit alongside him at the piano and play and sing.Spaghetti has since gone to doggie heaven. Spaghetti’s successor Linguini is no musical prodigy, but more importantly, he’s a dog. 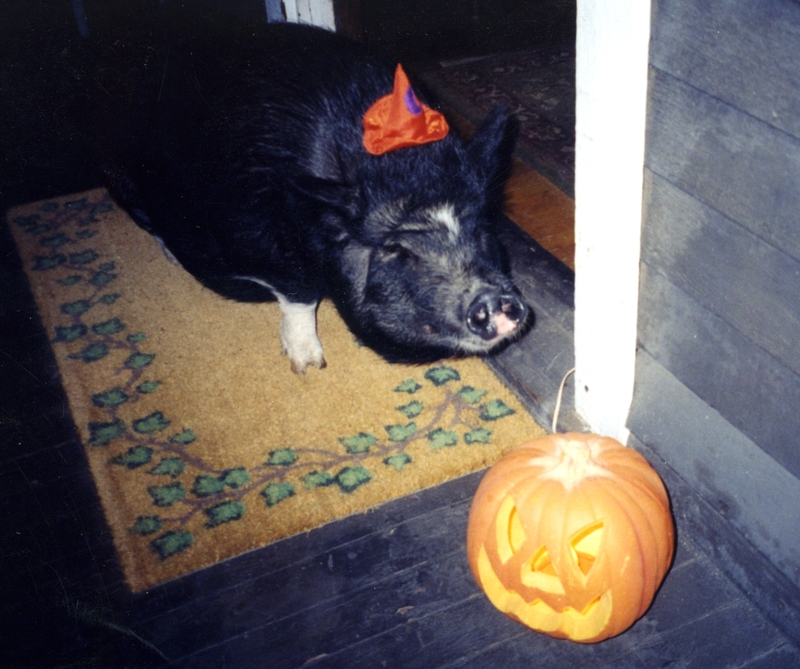 Feel free to make a pig of yourself and read “Pardon My Pig – Part 1” and “Halloween for Queen Porcine” first. You’ll find these in Tags under Pets and Pigs. What’s that you say? Keep in mind that’s my daughter you’re talking about. 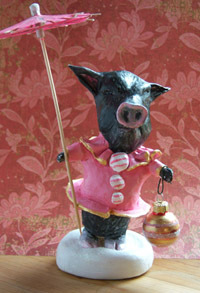 Okay, I admit that in “Pardon My Pig – Part 1,” I used a picture of an adorable piglet, who Maisie once bore (boar?) a passing resemblance to. But as you can see, she’s one big-boned gal. I tried to walk Maisie around the block once, but she doesn’t really walk – she ambles. I took my eye off her for just a second and when I looked back, she had uprooted a neighbor’s mid-sized shrub and was carrying it her mouth. First walk – last walk. Maisie has since been confined to the backyard where she’s happy to lounge under the fig tree (waiting for a ripe fig to drop into her mouth, especially after she gives the tree a good nudge). On a summer day you’ll find her lying out on the patio basking in the sun. Sometimes my neighbor Stella, who’s originally from Greece, leaves a bag of fruit hanging over the fence for “the pork,” as she refers to Maisie. I’m sure it’s just a language thing, but I did keep a watchful eye on “the pork” when I saw the Greeks had rented a large electric spit last Easter. Maisie escaped once. I’d gone out for lunch with my friend Eunice and as we walked home we saw a small crowd gathered next to the power company’s right-of-way. And what were they looking at? My pig of course, who was nibbling tall grass and acting oh so nonchalant. Eunice and I spent the next half hour “herding” Maisie down the alley with a big stick. Where’s a coolie hat when you need one? When Maisie hit 100 pounds, the local vet would no longer see her (weight discrimination!) so we called Chris, the Mobile Vet, who’s way cool and makes house calls. I know when he’s arrived because I can hear the whooshing sound of money flying out of our bank account. The first time Chris came for a visit, he actually looked at us straight-faced and asked what kind of toys we had to keep Maisie intellectually stimulated. I half expected him to tell us we needed to buy her a chess set. I took notes. Chris suggested we plant strawberries so she could graze on them. But after having seen the way she took that shrub out, roots and all, I opted to plant them above her grazing level. Chris also noted that Maisie’s hooves turned inward due to a genetic deformity, and said she could benefit from wearing some sort of orthopedic shoes. And where would we buy orthopedic pig shoes? Chris suggested that I could design them! I bought a pair of toddler’s sandals at Target and tried my best – really! I’m afraid I’m no cobbler, so Maisie’s destined to be a hobbler. The visits from Chris to trim Maisie’s hooves (her “pig pedicure”) every six months were pricey. Really, how hard could it be? We’re real do-it-yourselfers, so I purchased some harrier clippers. (Think hedge clippers for horses.) Now, to cut a pig’s hooves, you’ve got to first take them by surprise, then grab them by the back legs and flip them over on their back. One person holds them steady while they scream and moan, while the other does the clipping. (You should know they’ve measured the decibel level of a pig squealing, and it’s right up there with the sound of a jet engine at take-off.) Chris and his assistant had made it look so easy. Oh, the money we’d save! We’d procrastinated long enough. We had to do IT. Richard and I sat on the den floor with Maisie, who was already suspicious about our newfound interest in sitting on the floor beside her. Every time Richard casually made a move to grab her, Maisie sprinted out of reach. Exasperated, I finally said, “Let’s just DO this!” at which point Richard lunged across the room and grabbed hold of Maisie’s hind legs. How can I begin to describe what happened next? For two minutes, Maisie ran figure eights around the den dragging Richard behind her as though he were some rodeo clown. Richard finally let go and Maisie made a quick exit. Richard was dazed and had a nasty rug burn on his face, but he couldn’t feel a thing cause we were both laughing so hard. After that, we couldn’t call Chris fast enough. Sometimes us do-it-yourselfers need to learn to delegate so we can focus on the really important stuff – like the strawberries. You need to know that the base word for terrier and terrorist are the same. This is no coincidence because terrorists are terriers at heart and vice versa. Trust me. After three terriers, I know. (When you’re writing a script, this is what’s called Foreshadowing). My husband and I’d only been married a few months when we drove to Idaho to see his family. We needed some camping gear and that’s how we made the fateful stop at a Salt Lake City mall. We wandered into a pet store, where we saw The Dog (yeah, I know you should never buy a dog at a pet store). 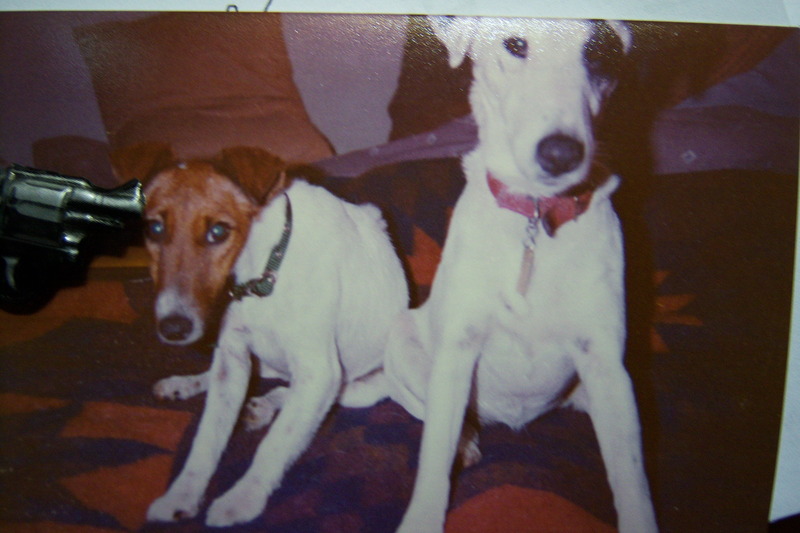 The Dog was a Smooth-Haired Fox Terrier with one black ear and a black patch over one eye. We put down a deposit and said we’d think about it. A week later, we were driving back to Los Angeles with “Roo” (named after Kanga’s joey in Winnie the Pooh). A week after that, we were looking for a new apartment, as we’d knowingly violated the “No Pets” clause. But we didn’t care. We were in love. Dog love is a powerful thing. But unfortunately this story isn’t about our wonderful dog Roo. No, it’s about her evil stepsister – Annie. Fast forward three years. A vet told us there was another Smooth-Haired Fox Terrier at the Pasadena Humane Society. This poor dog was on the home stretch (the doggie equivalent to death row). Seized with compassion, we raced to adopt the dog. It was only after we got home that we read the fine print. The previous owner had recommended that “Cindy” needed to be an only dog. Obviously, the previous owner wasn’t up to the challenge. For starts, she’d named the poor dog Cindy. We promptly gave Cindy a real dog name – “Annie” (as in Little Orphan Annie). Annie was also a runt, but she was an alpha dog with a capital A. So she already had two strikes against her. But dog people don’t give up so easily. In our heart of hearts, we were determined to make this work. Ah youth! Now Roo was the consummate dog. She chased a ball, she chased her tail, and she buried ice cubes (only to be disappointed later). Roo had a Sophia Loren wiggle to her walk and was hopelessly photogenic. Then there was Annie. Annie walked stiff-legged like a chicken across hot coals. She was a neurotic Woody Allen in a dog’s body. Her face was pinched, her expression worried. Annie was the vivacious cheerleader’s homely sister. This was the early 80s – long before Cesar Millan had his own show, The Dog Whisperer. Cesar was only a young pup himself, and he should count his lucky stars. I’m afraid if he’d taken Annie on as a client, he’d have opted for another career. Two months later, we moved to New York City. Annie almost didn’t make it. She wriggled out a crack in the window of the U-Haul in New Jersey and ran out into traffic. If you know anything about New Jersey, this was not an entirely insane action. It was Roo’s barking that alerted us to her escape. Do you think dogs ever have regrets? We moved into the Hotel Chelsea. Most people rented by the month, but there were still rooms that rented by the night, so we had a “house” phone. Every time the phone rang, Annie reacted like Pavlov’s dog. Only instead of drooling, she attacked Roo. (Cell phones had yet to be invented, so there was no way to put the phone on vibrate). This put a serious crimp in our home life. Things took a turn for the worse when Annie went into attack mode anytime someone knocked on the apartment door. It’s not like people could call ahead to let us know they were coming. I tried to keep the dogs separated. After our son, Taylor was born, I stooped to letting him crawl around the house while I kept Annie in the playpen. I didn’t think this was all that odd until the cable guy showed up and I saw him looking at me in a not so funny way. I designed and handcrafted a muzzle for Annie, which she promptly chewed through. Desperate, we called a highly recommended animal behavioral specialist who came out to observe Annie and Roo interact. After 45 minutes, he announced that he could get to the root of Annie’s problem. All it would take, he said, was a team a graduate students and a $100,000 grant. What? That’s when he broke it to us. The only solution for Annie’s problem behavior was a “high speed cranial lead injection.” He put it more bluntly – A bullet to the head. We wrote him a check, and no, we didn’t buy a gun. We proceeded to bite the bullet instead. For the next two years, Annie attacked Roo regularly. I continued to break up the fights and began to dread hearing a knock on the door. Once we gave Annie away to a woman upstairs. But after Annie growled at the woman’s young daughter, Annie was returned the next morning. We were at wit’s end. The solution to the problem, however, was one we never could have anticipated. Our sweet Roo was diagnosed with bladder cancer and died before she turned seven. Although we were devastated, she finally was at peace. Annie lived for another four years and was much nicer as an only dog, though she was far from perfect. We used to come home and find her stuck inside the four-foot-tall industrial trash can in our kitchen. She’d dive in head first and then couldn’t extricate herself. I liked to leave her in there thrashing about for an extra few minutes, just for Roo’s sake. But we did come to (dare I say it?) love Annie. When Annie was 12, she died a peaceful death in my arms. Unlike Roo, who was buried in Vermont, Annie was sent off to be cremated. Two weeks later, Richard was on the phone with an important client when he heard pounding on his office door. A brusque voice with an unmistakable Brooklyn accent barked, “Hey, mister, I got your dog out here in a can.” Annie’s ashes were returned to us in a faux Americana tin can inside a white box with plastic flowers on top. It looked like a prom corsage. A pre-printed label identified the contents as “Beloved Pet.” Later when we finally left New York, we packed “Annie” with the china. For years, my husband swore whenever he walked past the can, it growled at him. We moved back to Los Angeles and bought a home only a few miles from the Humane Society where we’d adopted Annie so many years before. We’d come full circle. Eventually, we scattered Annie’s ashes beneath the lemon tree. We hoped it might sweeten her disposition in the afterlife. I’m not a cat person. It doesn’t help that I’m horribly allergic to cats, and the one time I actually petted the cat of a guy I was interested in, my eyes ballooned out and were swollen shut for two days. The fur didn’t fly, but the relationship did – out the window. I grew up with dogs and that’s that. Dogs listen. They scare away burglars and sometimes the mailman. They provide cheap entertainment as they’re basically the village idiot dressed in a fur coat. You leave for ten minutes and when you return, they’re so excited to see you you’d think you’d been gone ten years. Gary Larson did a great comic for The Farside with the caption “If dogs and cats wore hats.” The cats are sitting in a tree wearing fedoras and look like drugged-out jazz musicians, while the dogs stand panting down below wearing backwards baseball hats. Nailed it. In the movie The War of the Roses, Danny DeVito, who plays the warring couple’s attorney, summed it all up at the end when he noted this was a Cautionary Tale about what happens when dog people marry cat people. I’ve always maintained that having a dog is great practice for being a parent. You can’t go out for a relaxing evening without wondering what your dog is up to. It’s past their dinnertime. They’re obviously starving and eating the couch. It’s past the time for their walk. They’re obviously unloading on the living room carpet. These are the thoughts that not only spoil an evening out, but make you feel those first grown-up stirrings of responsibility. I believe people with low-maintenance cats are destined to raise latch-key children. But I could be wrong. I housesat a friend’s cat once and actually donned oven mitts so I could pet Pookie. I tell you this so you know I’m not all bad. I found the picture of the cat above on Flickr and thought it was so much fun I just had to use it. Since I’m not a cat person, I figured I might someday include it in a post entitled, “Things I’ll Never Write About.” But since most of my friends DO have cats, I’ve decided to make nice. My friend Cathy has written two great stories about cats (she makes them sound almost dog-like in their purrfection! ), which you can read by clicking on the following links: Malcolm, Old Friend and The Brothers Angora. After living with a pig for 12 years, I’ve come to think of it as almost normal. In the same way that having webbed toes is normal. So, sometimes I forget to mention we have a pig for a pet. This failure to forewarn visitors to our house of what’s in store, carries its own “shock and awe” factor. One day the new neighbors stopped by. As we stood talking in the kitchen, the back door flew open with such force, you’d have thought a bomb had detonated. There in the doorway stood…I could see from the startled looks on my neighbors’ faces that they were straining to make out just what “it” was. The silhouette of this creature was backlit by blinding sunlight. I watched as their eyes strained to adjust. Dust was rising from this beast in swirls and the sunlight grew hazy. The visitors stood frozen, like ancient inhabitants of Pompeii, blanketed in the ash. “Oh,” I said, trying to sound casual. “I forgot to tell you we have a pig.” Maisie, yes the beast has a name, strode into the kitchen like Gary Cooper entering the saloon in “High Noon.” She looked like she was gunning for trouble. “Whatever made you want to get a pig for a pet?” I’ve been asked. What a dumb question! Dumb questions are questions that I don’t have answers for. I do remember thinking the little talking pig in “Babe” was adorable. We’d also just bid on our first house. The offer was insultingly low, so no one was more surprised than we were when it was actually accepted. A celebration was in order. What better way to celebrate acquiring the yoke of a mortgage, than by buying a farm animal! This has got to be a sanctified ritual somewhere in the world. The person at the pet store was convincing. This “miniature” pot-bellied pig would grow to 33, maybe 44 pounds max. So we acquired Maisie at the tender (no, not that type of tender!) age of 12 weeks. She weighed in at a whopping 11 pounds with one brown eye and one blue one. No sooner had we moved into our new house then Maisie began to grow. And grow. I used a Weight Watchers scale to monitor her food intake. Carrots, Cheerios, celery, and a few protein pellets. If I lived on that diet, I’d look anorexic. But Maisie kept packing on the pounds. We bought a larger pet door. Richard stopped by the pet store to inform them that the pig they’d sold us was growing at an exponential rate. “You must be feeding her too much,” the pet store owner scolded. My husband mentioned that we’d measured her and she was now 41 inches long. Silence. “Wow, she must just be big-boned!” was the reply. The owner had a sudden urge to help other customers. So we settled into the routine of having a pig for a pet. This routine included breakfast anytime after 4:30 a.m. We took to locking Maisie out of the bedroom, and then the den. But it’s hard to just roll over and go back to sleep when you can hear the doors straining on the jams as she used her body as a battering ram. Our dogs followed her lead and joined in the charge. 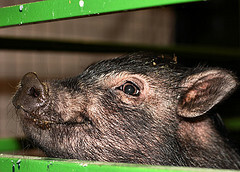 There’s a reason that when George Orwell wrote “Animal Farm,” he made pigs the ones in charge. Someone once said that cats look down on humans, dogs look up to them, but pigs look at them as equals. This person knew a pig. We thought it was adorable when Maisie was still small enough to climb into our son Ian’s, bed. It wasn’t long though until we’d come in and find Ian sleeping on the floor while Maisie snoozed with a contended smile, her head laying on Ian’s pillow. Turned out she waited till he dozed off then gave him the heave ho. The final straw came when a client of my husband’s stopped by. We walked into the kitchen to find Maisie standing in a sea of brown mud. No wait, it was chocolate! She’d gotten into a huge box of hot cocoa packets and was mixing up a batch on the kitchen floor. Exasperated, Richard spent the next day at the local hardware store coming up with a makeshift latch more befitting a submarine hatch. I took to moving everything higher up, like you do when you’re camping and don’t want to put out the welcome mat to bears. We’d underestimated out opponent. It was Garry Kasparov facing Deep Blue and my money was on Deep Blue.